When you live with chronic pain, every day your body screams “QUIT!” How do you manage to keep going despite the pain, fatigue, and discouragements that threaten to overwhelm both body and soul? Continuing to put one foot in front of the other when experiencing daily pain and exhaustion is not easy, but it is possible when you adopt thoughts, attitudes, and habits that help you cope instead of quit. 1. Accepting this circumstance of chronic pain as a gift from God to refine your character and strengthen your soul will enable you to see the value in your situation. This perspective can bring the joy back into a hard life. Acceptance of the pain itself also does wonders for your ability to cope. When you realize that the pain is not going away, but that life can still be good anyway, you are well on your way to being able to cope when you would otherwise normally quit. 2. Learn to keep going when you need to, and rest when you need to. This is a learning process that requires a balance of pushing yourself when you need to push and allowing yourself to rest when you need to rest. Carving rest days into your schedule and rest periods into your days will enable you to keep going for the long haul when you would otherwise quit. 3. Be patient with yourself and others. You will continually fail your personal expectations, and others will, too. While not an easy lesson to learn, the upside is that you do get to practice it all the time (smile). 4. Ask for and rely on the grace of God to sustain you through each day. Grace is a concept that is hard to understand apart from God, but a good definition in this context might be: “the strength God gives to help you make it in hard times.” When I ask God for His grace and strength, somehow I am able to “press on” on days when I have to keep going but my body screams no. Try it, and you will see God enable you to do things that you know you otherwise couldn’t do. 6. Speaking of temptation to be discouraged, I am reminded of the need to stay alert to our Enemy’s temptations to be discouraged and quit. God’s enemy Satan is also our enemy, and he attempts to defeat us as often as he can, though we don’t always realize it. He would love none other for you to quit everything, including life itself, because of your chronic pain and illness. Being aware of it and recognizing it is a big part of being able to overcome the temptation to give in to the desire to quit. 7. Deal with bitterness and other negative emotions daily, especially those that make you want to quit. Difficult emotions like anger, bitterness, frustration, fear, anxiety, and depression are emotions that we are forced to deal with all the time when living with chronic illness. It helps to deal with them as soon as they crop up so they don’t become a way of life. If you are dealing with a particularly hard emotion that gives you daily trouble, consider talking to a life coach, pastor, or mental health counselor. 8. Let God take care of your heart and your needs when others won’t. 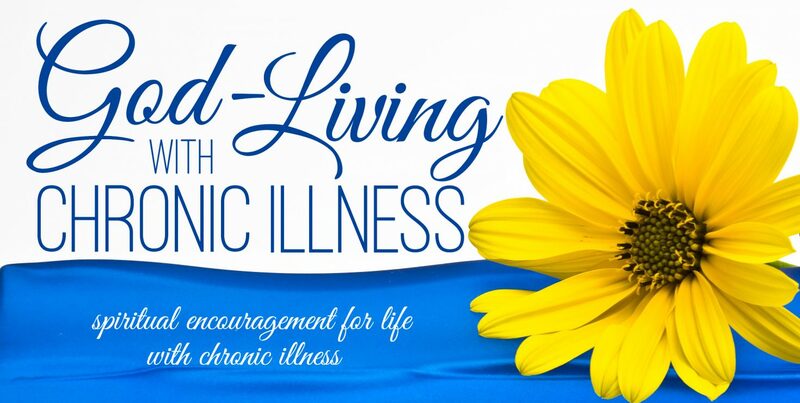 Unfortunately, when you live with chronic illness, other people in your life become tired of hearing about it, and sometimes become tired of taking care of you when you need it. When that happens, and even when it doesn’t, taking your needs, and especially your heart’s needs, to God will help remind you that He is the one ultimately taking care of and providing for you. When others fail you, He will not. 9. Remove “I CAN’T” from your vocabulary. If you don’t remove those two words from your vocabulary, you will never do anything because chronic pain makes you feel capable of nothing. Most of the time, to be able to accomplish anything, you will have to force yourself to put one foot in front of the other. Remembering that will help you do what you need to do to complete the task at hand, while promising yourself a rest break when you’re done. Rinse and repeat, every day, but reward yourself when a goal is accomplished so that daily tasks won’t feel meaningless. Keeping our eyes on our future hope is how we endure painful circumstances, especially the kind that don’t go away. If we rely on God as we take one day at a time, we will make it through each day, until our very last day which will usher us into an eternity where our pain is forgotten and our present hope becomes our forever reality. This entry was posted in Dealing With Emotions, Faith, Life with Chronic Illness, Uncategorized and tagged Chronic illness, chronic pain, Discouragement, Faith, Hope, perseverance, perspective, press on, quit, quitting. Bookmark the permalink. Hi Dionne, glad this article was helpful. Hope you have a blessed Mother’s Day.